SAN DIEGO (AP) — In an interesting crossover, Taylor Canfield of the America's Cup challenger Stars & Stripes Team USA has joined the U.S. team in the fledgling SailGP league just two weeks before the inaugural regatta in Sydney, Australia. 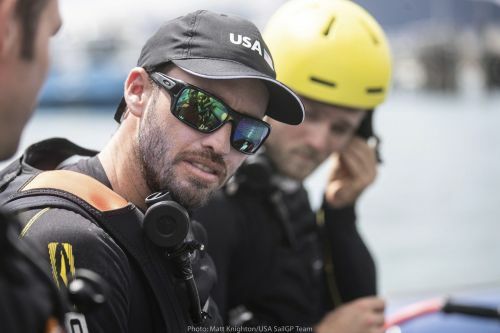 The U.S. SailGP team announced the addition of Canfield as flight controller-tactician a day after launching its 50-foot foiling catamaran on Sydney Harbor. The opening regatta in the six-country league is Feb. 15-16. Canfield is also helmsman of Stars & Stripes Team USA, which launched in December and is selecting its sailing crew and building its boat for the 36th America's Cup in 2021 in Auckland, New Zealand. The addition of Canfield will give the young U.S. SailGP Team experience and depth. U.S. SailGP Team skipper and helmsman Rome Kirby, who won the America's Cup with Oracle Team USA in 2013, has two weeks to solidify roles on the boat. It takes five crewmembers to sail the boat and the U.S. team now has six sailors, so it could have a rotation system. "Taylor is a great addition to the team, not only for his world-class experience, but for his competitive intensity on the water and laid-back style on land," Kirby said in a release. "He is a great fit for our team." Canfield, one of the world's top match-racing sailors, said he's raced with and against members of the U.S. SailGP Team many times. "The SailGP concept is incredible and what this sport has needed for a long time," Canfield said in a release. "To be racing at the top level of the sport, at extreme speeds against the best in the world — I can't wait." The F50 catamarans are capable of going faster than 50 knots (57.5 mph). Mike Buckley, co-founder and skipper of Stars & Stripes USA, said the America's Cup team supported Canfield's decision to join the SailGP team. "He was psyched to do it and the SailGP guys are equally psyched to have him, as they should be," Buckley said in a phone interview. "Obviously, as much high-performance sailing in an organized format that any of the team can get is a huge advantage." Sailing with the SailGP will give Canfield more experience with foiling. The catamarans rise up on hydrofoils and skim across the tops of the waves with both hulls out of the water. SailGP took three 50-foot foiling catamarans from the 2017 America's Cup and redesigned and re-engineered them, and built three new ones. The America's Cup is switching to a radical foiling 75-foot monohull. "At the end of the day, I don't think either of the boats will sail too differently than the other," Buckley said. "Whether two hulls out of the water or one hull out of the water, the key takeaway is out of the water." Buckley said Canfield will be able to work around the America's Cup team's training schedule. Stars & Stripes Team USA has already had one foiling camp in Long Beach and has two more scheduled in the next several weeks, as well as an open combine tour as it selects a coed crew. Its boat is being built at Composite Builders in Holland, Michigan, and should be ready by early summer, Buckley said. After the Sydney SailGP regatta, the tour stops in San Francisco on May 4-5 and New York on June 21-22.